MacKenzie Bezos also said she would surrender all of her stake in The Washington Post and the space exploration firm Blue Origin to her ex-husband, as well as voting control of her remaining Amazon shares. MacKenzie Bezos, ex-wife of Amazon founder Jeff Bezos, announced Thursday they had finalized their divorce, and that she would surrender 75 percent of the couple's shares in the tech giant. 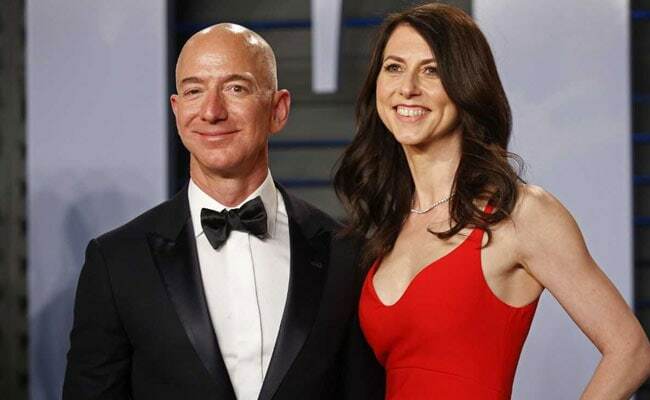 MacKenzie Bezos also said she would give all of her stake in The Washington Post and the space exploration firm Blue Origin to her ex-husband -- the world's richest man -- as well as voting control of her remaining Amazon shares. In a filing with the US Securities and Exchange Commission, Amazon said MacKenzie Bezos now controls four percent of the company's outstanding common stock. At Amazon's current share price of $1,812 a share that would be worth some $35.6 billion. "Grateful to have finished the process of dissolving my marriage with Jeff with support from each other and everyone who reached out to us in kindness," MacKenzie Bezos wrote on Twitter. "Happy to be giving him all of my interests in the Washington Post and Blue Origin, and 75% of our Amazon stock plus voting control of my shares to support his continued contributions with the teams of these incredible companies," MacKenzie Bezos said. "Excited about my own plans. Grateful for the past as I look forward to what comes next," she said. Jeff Bezos, in a Twitter message of his own, said his now ex-wife has been "an extraordinary partner, ally, and mother." "I'm grateful for her support and for her kindness in this process and am very much looking forward to our new relationship as friends and co-parents," he said. Jeff Bezos was listed as the world's richest person in a Forbes magazine list published in March, ahead of Bill Gates and Warren Buffett.